Jose Luis Bermudez is solid wire business product manager at Esab Welding & Cutting Products in Hermosillo, Mexico; jbermudez@esabmexico.com.mx, < a href="http://www.esabna.com">www.esabna.com. When it comes gas-metal-arc-welding (GMAW) of sheetmetal, choosing the right electrode (filler wire) is essential for maximizing productivity. But is there such a thing as a perfect filler wire that enables sending parts to the next fabrication step with as little human intervention as possible? Let’s have a look. Fig. 1—A single welding pass made with a conventional S-6 filler wire yields numerous silica islands. Fig. 2—A single welding pass made with an S-6 wire featuring enhanced metallurgy will require much less cleaning time. Fig. 3—Three passes were used to make these welds. The top bead uses a next-generation S-6 wire while the bottom bead uses a conventional S-6 wire and must be deslagged before moving to the next production step. ER70S-3 and ER70S-6 filler metals are the two most widely used wires for welding thin sections of mild steel regardless of the GMAW process. (For purposes of this article, assume that these wires are used with shielding gas blends that feature a high argon content, such as 75/25 argon/CO2 for short-circuiting GMAW or a blend with 90+-percent argon for modified spray-transfer GMAW. An S-3 wire has moderate levels of manganese and silicon for deoxidation and cleaning action and should be used on base materials that are clean, oil-free, have a rust-free base and have light to no millscale. An S-6 wire uses higher amounts of manganese and silicon to combat contaminants and millscale, as well as to improve puddle fluidity (wetting action) to help wash-in the puddle at the weld toe. Historically, the drawback to using an S-6 wire was that it generated silica islands, or gold-brown glassy spots that result from bringing impurities to the surface of the weld (Fig. 1). Painting over a silica island may cause the paint to flake off. Often called a “pop out,” such defects cause aesthetic and rust issues. When using an S-6 wire, and especially in multipass welding applications, manufacturers must stop production to deslag. Further, excessive buildup of silica islands creates a risk of arc-ignition issues. Erratic arc starts might lead to poor fusion with the wire burning back to the contact tip and excess spatter. As a result, some welding procedures specify an S-3 wire, which generates fewer silica islands, even though it has poorer wetting action that can lead to other issues. Because S-3 wires contain lower amounts of alloys, some believe that its use saves money when, in fact, its poorer wetting action and the resulting issues may add to overall costs. Fig. 4—Enhanced wires have even more tightly controlled ranges than other premium wires. Fig. 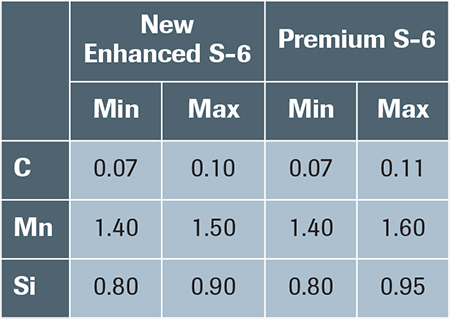 5—S-6 wire composition standards as set by EN/ISO and AWS. Filler-metal manufacturers have responded to customer demand for such materials with S-6 filler wires that combine enhanced compositions and innovative coating technologies. The enhanced metallurgy reduces overall formation of silica islands, and creates a slag that self-releases or easily brushes off (Fig. 2). As a result, users spend more time engaged in productive activities and less time cleaning. For example, a construction-equipment OEM reduced arc-ignition errors by 66 percent in multipass applications (Fig. 3) using an enhanced S-6 wire. Previously, excess silica islands prevented positive arc ignition. When this occurred, the manufacturer needed to shut down a robotic-welding station and spend an average of 3 min. to clean the silica islands. With a rate of $280/hr. in the station, each stop cost $14. Batch-to-batch consistency, especially in robotic applications, also can be an issue. To address this, wires with enhanced metallurgy use a tightly controlled range for the primary alloying elements of a mild-steel wire (carbon, manganese and silicon), as well as tightly controlled amounts of as many as 17 raw elements (Fig. 4). 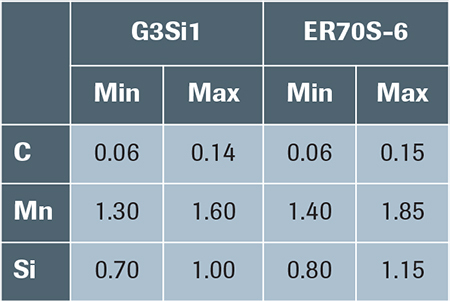 By way of comparison, the acceptable range for alloying elements is fairly broad (Fig. 5). As a result, standard S-6 wires open themselves up to significant variations in batch-to-batch performance, which in turn can create the need for constant fine-tuning of welding parameters. If spatter levels increase, one culprit could be a change in metallurgy. Enhanced S-6 wires also provide good puddle fluidity. As Fig. 6 shows, these wires provide a flat bead profile and excellent tie-in at the weld toe. They can reduce or eliminate the need for gas-tungsten-arc dressing or grinding to remove stress concentrations, which may be required in other situations. This fabricator of replica race cars uses a noncopper-coated wire because it runs more smoothly and reduces issues related to clogged tips and liners. With consistent batch-to-batch performance, operators can set it and forget it, even after starting on a new pallet of wire. In addition to enhancing the wire formulation, the next generation of GMAW wires uses innovative wire-coating technologies that stabilize the weld process and provide superior arc stability. As a result, tests show that they can reduce spatter by as much as 30 percent. Most standard S-6 wires use a copper coating, and many in the industry incorrectly believe that the coating improves current transfer, reduces tip wear and protects against rust. In fact, manufacturers use a copper coating as one of their options to improve wire-feed performance. One downside of a copper-coated wire is that particles flake off and clog the gun liner and contact tip. Left unchecked, this clogging creates a drag on the wire and poor wire-feed performance, which in turn may lead to erratic arcs and excess spatter, and even cause the wire to burn back to the contact tip—all of which cause unplanned downtime. While noncoated wires inherently benefit robotic applications, they are essential for the Swift Arc Transfer (SAT) process. SAT uses smaller-diameter, noncoated solid wires at fast wire-feed speeds to increase current density, which in turn can increase deposition rates. For example, a demonstration of pulsed GMAW vs. SAT showed how SAT offered travel speeds of 46 in./min., twice as fast as pulsed GMAW. For applications where flaking is an issue, premium noncoated wires are an option, as they generate far fewer particles and enable a longer run time between scheduled maintenance and liner and tip replacement (Fig. 7). These wires feature a proprietary coating that is not obvious to the naked eye. 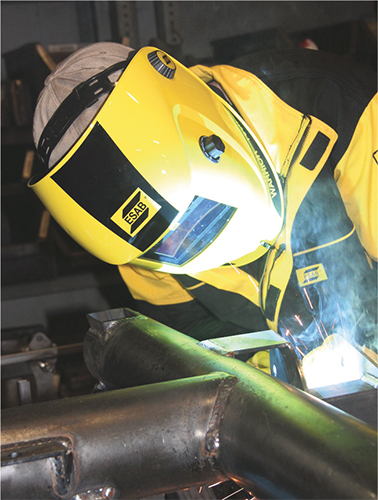 To confirm performance, Esab worked with ISF Aachen, a German welding-research authority, to conduct a benchmark survey that compared premium noncoated wires with a wide selection of copper-coated wires. Results prove that the noncoated wire runs longer without burning back to the contact tip (more than 330 min. of continuous welding compared to 220 min. or less for copper-coated wires), requires less force to feed, increases arc stability and reduces spatter. If there is one take-away for welding, production and manufacturing engineers, it should be that filler metals within an AWS classification offer widely varying degrees of performance, and this is true whether working with solid wire, aluminum wire, stainless-steel wire, etc.